Income inquality: Is it such a big deal? Comedian Louis C. K. famously noted that “everything is amazing right now and nobody is happy.” We live in a world of unprecedented prosperity and are much better off then our parents and grandparents were. Since 1950, the average house size has doubled, while the average family size shrunk. We’ve gone from kids sharing a bedroom to each kid having his or her own bedroom. In 1980 a second land line phone was a luxury. Today teenagers carry iPhones with more computing power than most 1990s era PCs. Regardless of the progress, the recent recession and sluggish recovery has turned our attention to the growing gap between rich and poor. Income inequality is not such a big deal if everyone is winning. It’s no big deal that Nike CEO Mark Parker got a raise of more than $3 million last year. Sure, his raise makes him much better off, but I can’t think of anyone who is worse off because of the raise. Are Nike workers paid less because of the raise? Are we paying more for shoes because of the raise? Did Nike’s stock price drop after the raise was announced? While it may be the case that the rich are getting richer, it’s not clear that the poor are getting poorer. According to the Census Bureau, from 1967 to 2010, inflation-adjusted household incomes for the top five percent grew by $72,350. Over the same period, household incomes for the bottom 20 percent grew by $2,900. Yes, the rich are getting richer, but so are the poor—just at a slower rate. More important than figuring out whether the income gap is growing, the much bigger question for an economist is: Does it matter? The overwhelming consensus among economists is … maybe. Since the data don’t provide a very satisfying answer, the next question is: Could it matter? Perfectly equal distribution of income would destroy any incentive to put in the effort to get ahead (you get the same income whether you work or not). On the other hand, a system in which one person earns all the income and everyone else gets nothing, would destroy any incentive to put in the effort to get ahead (a perfectly unequal system in which you would get nothing whether you work or not). Thus, there must be some optimal level of inequality between perfect equality and perfect inequality. The debate these days is on what that optimal level is. Can we shrink the income gap? The knee-jerk response to a growing income gap is more progressive income taxation. However, increased taxes to redistribute income do nothing to foster economic growth. On the other hand, the figure below shows that growing employment may be one powerful way to slow the growth of the income gap. While it’s true that since 1979, income inequality has increased in every state, there are wide differences among states. For example, inequality increased by four times as much in New York and DC as it did in Alaska and South Dakota. Income inequality seems to be an East Coast problem first, followed by the Rust Belt states of Illinois, Ohio, and Michigan. Most striking is the relationship between income inequality and employment. 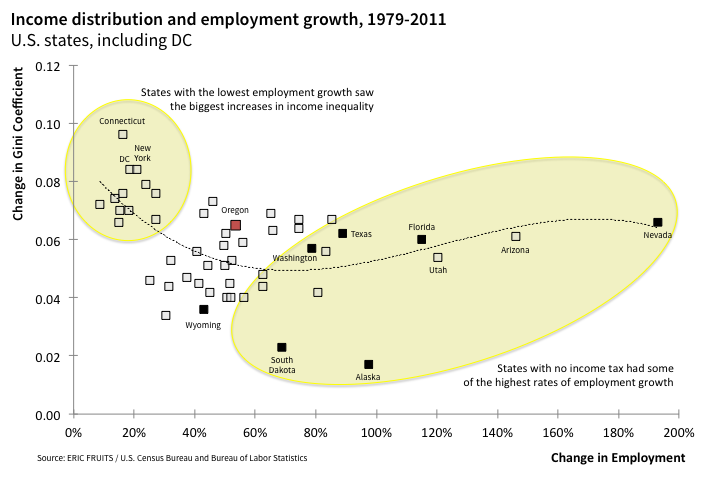 States with weak employment growth saw the steepest increases in income inequality. Connecticut, New York, and DC had employment growth that was less than half the U.S. average and had the steepest increases in income inequality. Also striking is the fact that employment grew faster in states without income taxes (shown by the black markers). These states also did not see an change in income inequality that was much different from the U.S. average. In this way, reducing income taxes may be a way to grow employment without necessarily increasing the income gap. There is no consensus among economists that income inequality has any impact on economic development. However, policymakers seeking to make income distribution more equitable should turn first to finding ways to make a bigger pie by growing employment rather than figuring out how to cut the pie into smaller slices by tax-and-spend redistribution programs. Originally published at Oregon Business.